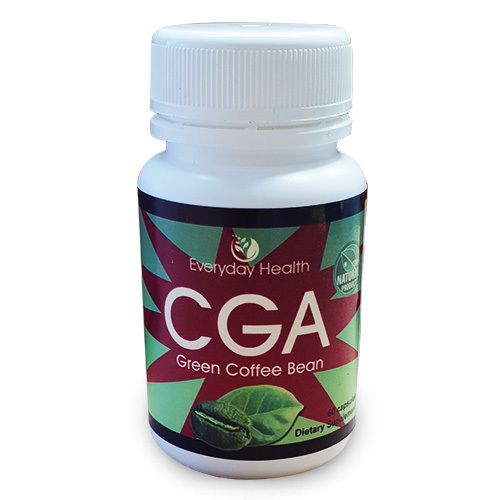 CGA (Chlorogenic Acid) extracted from Green Coffee Bean is used to manage weight, diabetes, and improve well being. Coffee beans are naturally green, but they are usually roasted to a brown color before being sold to consumers. This process changes the chemical make up of the beans and breaks down most of the chlorogenic acid content. 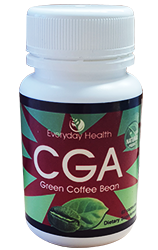 On average raw grean beans contain 5% CGA, however breakdown by about 60 percent in medium roasts, and 100 percent breakdown in dark roasts, so taking that into account, you would need to drink at least 20 cups of medium roast coffee to get the Chlorogenic content of 1 of our capsules. Some human studies show that Chlorogenic acid (CGA) can reduce the absorption of carbohydrates from the digestive tract, which lowers blood sugar and insulin spikes. Therefore taking green coffee bean extract can be like eating a lower carbohydrate diet. Other studies have shown that chlorogenic acid can reduce fat absorbed from the diet, reduce fat stored in the liver and improve the function of the fat burning hormone adiponectin. The concept behind the science of CGA is simple. When the body is absorbing less fat and sugar it burns fat reserves for energy, therefore reducing body fat. 3 or more.. Half Price Today! It will start to work immediately. Weight loss can take some time, and depends on many things: Diet, Lifestyle, Genetics, Disease, etc, Generally you can eat the same food as before while still getting the benefits, however a balanced diet with exercise, is the key if you want faster results. Do these pills contain caffeine? Generally you will not get any side effects, however those with sensitivity may experience: upset stomach, increased heart rate, frequent urination, trouble sleeping, restlessness, anxiety. If you have any side effects, stop taking and check with your doctor. Green coffee interacts with some medicines. Some of these include stimulants, blood thinners, and medicines for: Heart problems, Weak bones, Lung diseases, Menopause, Depression, Schizophrenia and diabeties. Check with your doctor if yoiu are taking other drugs.